A momentous event occurred a few weeks ago. My sister gave birth to a baby girl. Between me and my siblings, we’ve so far produced five boys, so the arrival of a little girl into the mix is most exciting. 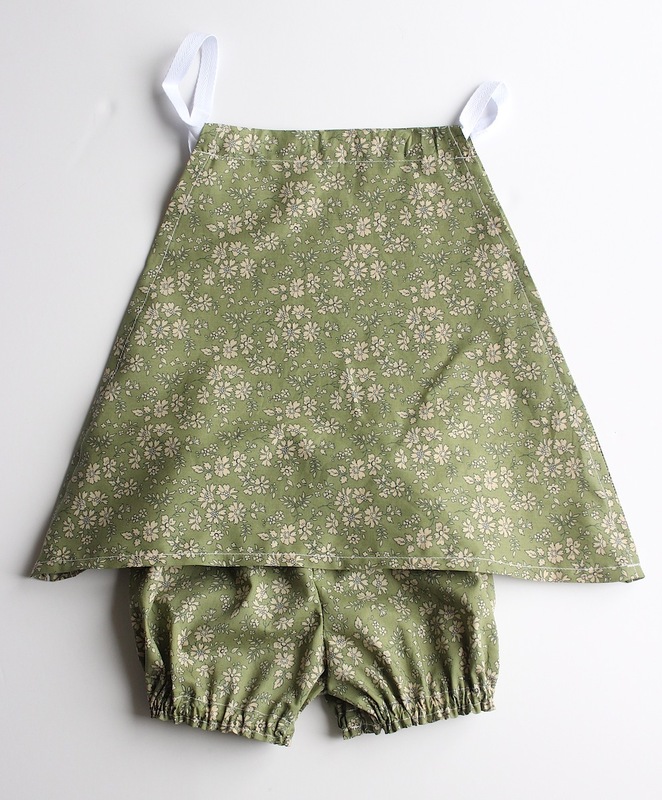 Also exciting for me was the chance to make some cute little dresses and bloomers. 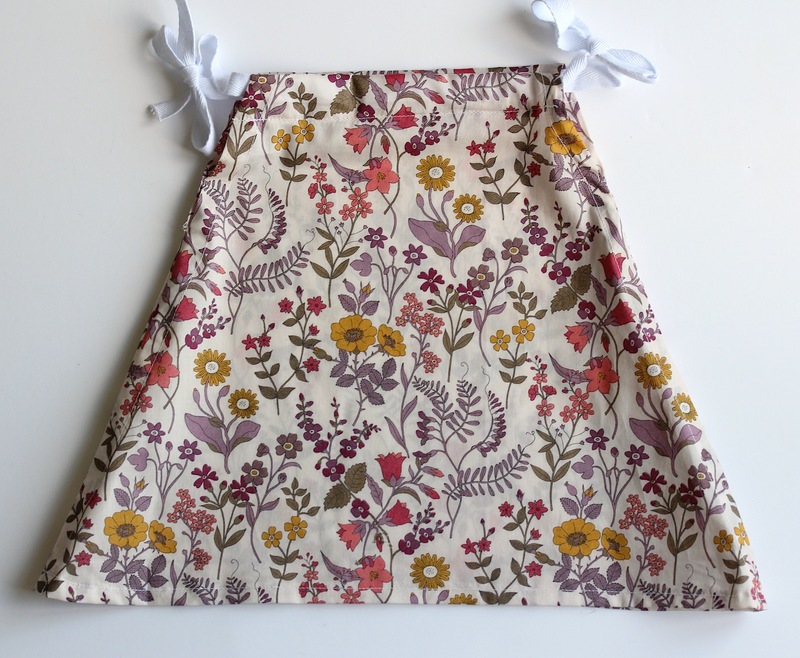 I love my boys (of course, it hardly needs saying) but if there is one thing I miss not having a girl, it’s the chance to sew tiny girl clothes with beautiful Liberty fabrics. But that chance I now have! The sewing machine was retrieved from the attic, dusted off and I got to work. I made two matching sets, both from the same patterns and, sigh, just look, aren’t they sweet? The dress is from the Purl Bee tiny triangle dress pattern. It’s a straightforward, though slightly fiddly sew, I found. Ironing 1/4 inch seams onto every edge was a little bit of a faff and I got a bit bored of trying to endlessly measure them to make sure they were straight, so, well, some of them ended up a tiny bit not straight. Do any more regular sewers have any tips for good ways of going about that? Anyway, other than that, it was very simple to put together and the end result looks lovely. I think my only criticism is that, in the wearing though not so much in the photos, the triangle shape is actually a little bit too extreme — it really does stick right out at the sides. This would probably be fine on a standing-up toddler, but on babies who spend their time lying or sitting, then there’s a little bit too much material in the way. 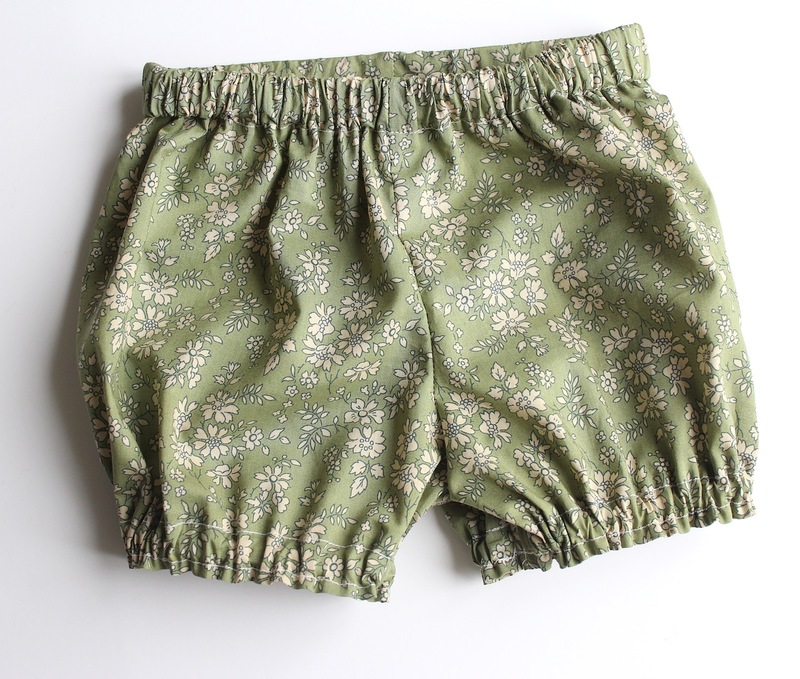 The bloomers are made from a free pattern by Sewing Mama RaeAnna on Craftsy and I was utterly, completely delighted with these. They look way more complicated than they were to make, just using some elastic round the waist and legs to get that cute gathering, and I sewed them up in no time. If I ever have another summer baby (boy or girl) I will definitely be making loads of these as nappy covers as they are seriously adorable. The fabric for both is a Liberty tana lawn*. 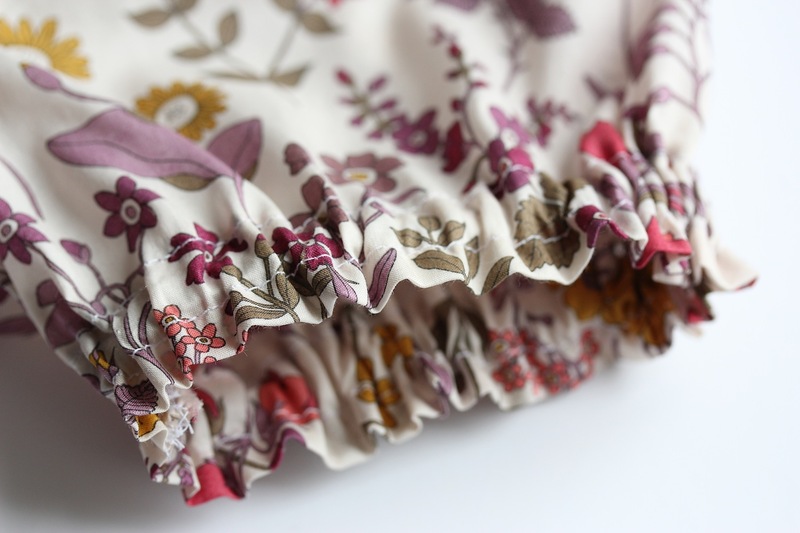 The designs are called Capel L (the green flowery one) and Lola Weisselberg (the purple, more ornate pattern). The first is available on the Liberty website, though I can’t find the second. I have to confess, I bought both from eBay. 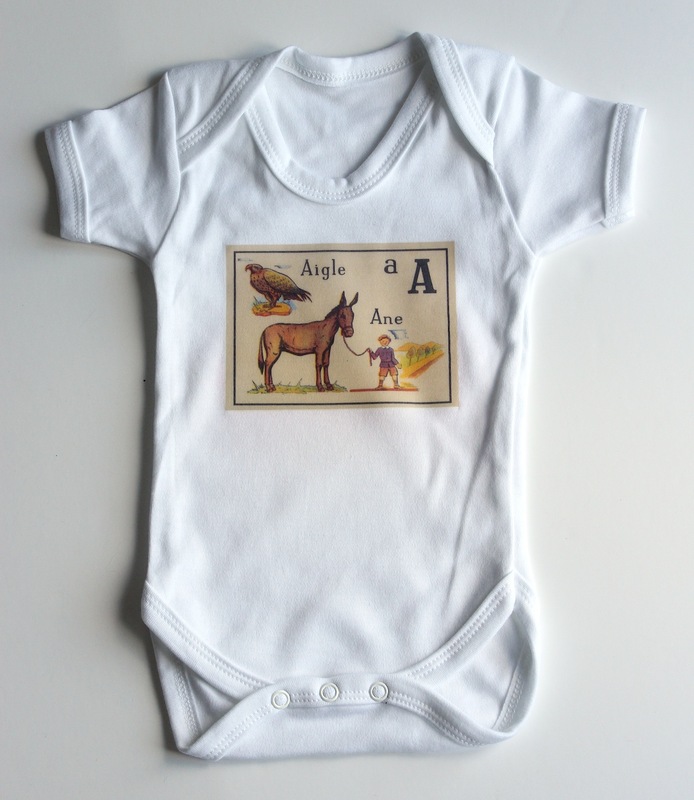 To go with the dresses I had to – of course – make some personalised babygrows using my go-to fabric transfer paper method. 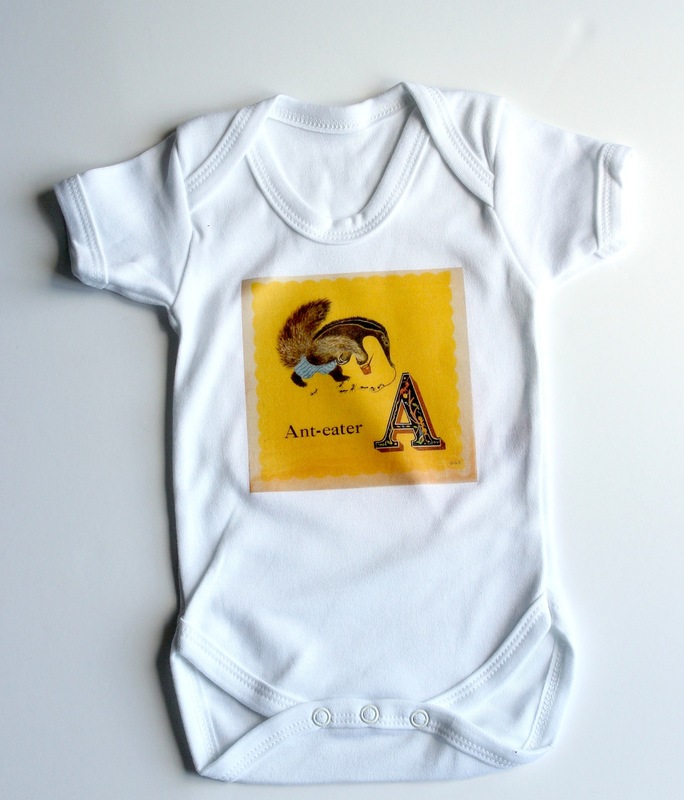 I made her older brother a set of printed babygrows when he was born (you can see them here: a very important arrival) and I wanted her to have some of her own as well. 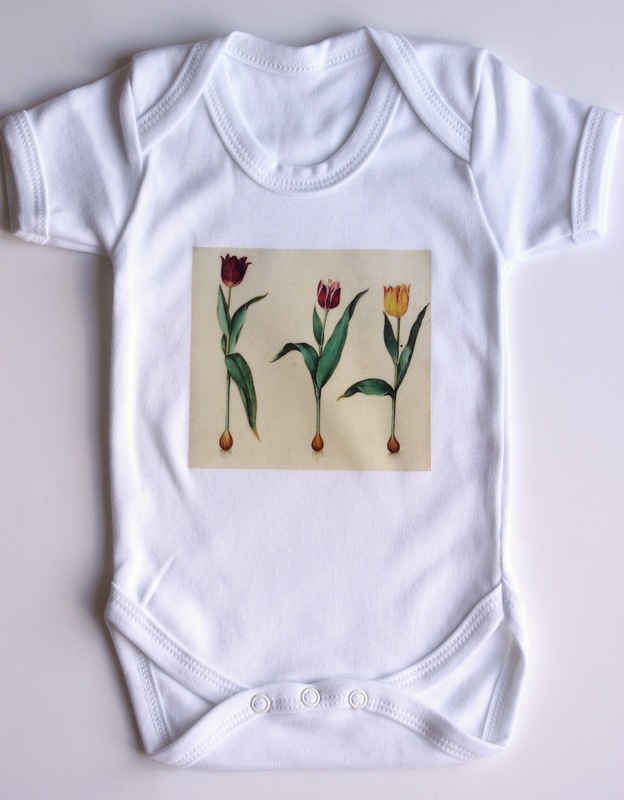 The tulips are a Graphics Fairy image; I just couldn’t resist using some more flowers since I rarely have the chance to put lots of flowers onto my boys clothes. (Not that the sproglets don’t love them, actually, so maybe I should break away from all the gender stereotyping.) The As because her name starts with A. The anteater is from an amazing vintage alphabet I first found years ago, but use at every possible opportunity I get. The French A is from a new discovery: a partial vintage alphabet, also free from copyright. They have been a big hit. I saw my niece today, and she was wearing her brother’s hand-me-down elephant trousers (from here) and my sis said they were great for little girls too: nice and baggy, so easy to put on, and comfy for the summer. 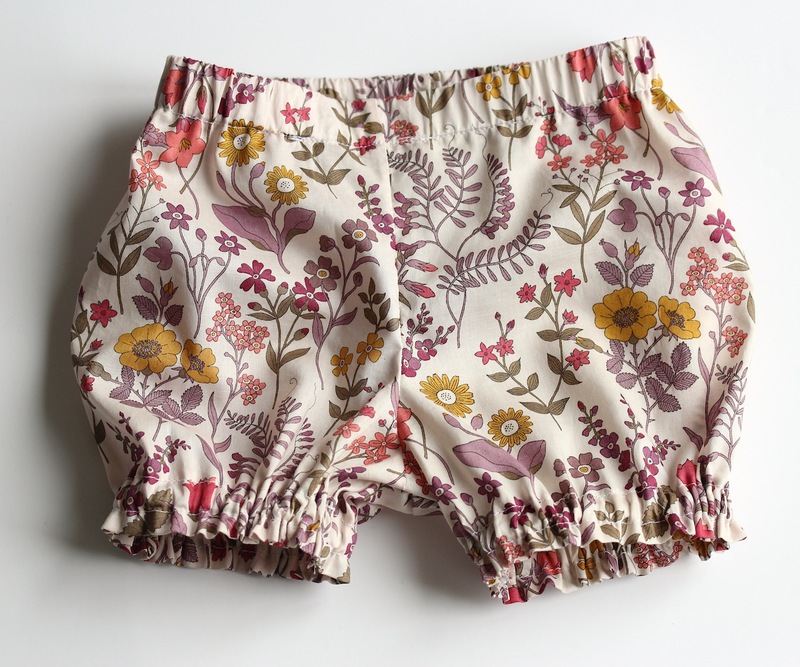 I think I might make her another pair in some more floral Liberty fabric! So pretty – you have the skillz! And now I want a baby! 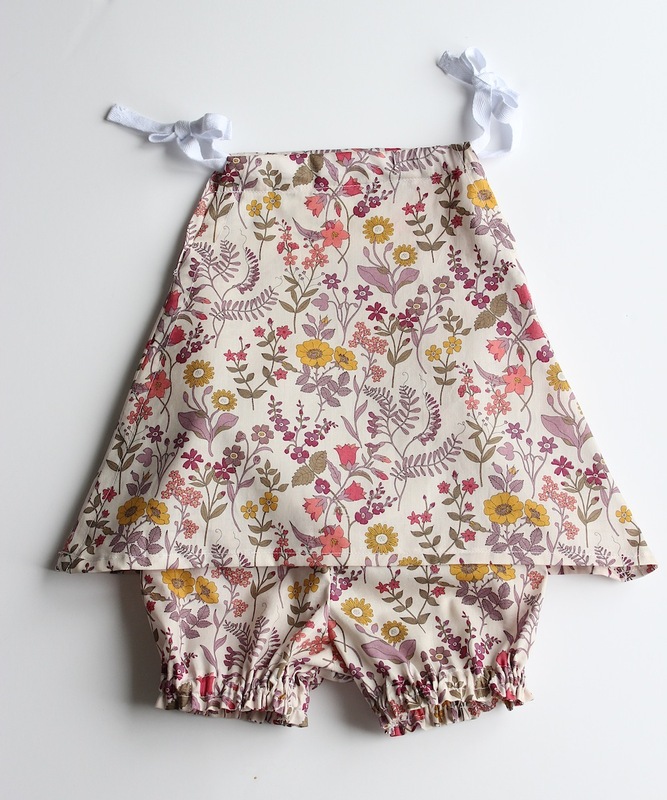 These are so pretty Sabrina 🙂 Love the cream floral fabric and those bloomers….so cute. I haven’t been getting notices of your blog as in the past and missed this entry. Liberty of London! I am in love with it and slowly using it for items in my Etsy shop. It seems that US buyers are somewhat clueless about its qualities but those with knowledge are attracted. I carted fabric back home and then sold a jewelry roll made from it BACK to a buyer in London….who was not happy about the VAT tax!